Are you ready for World Toilet Day? This esteemed celebration of porcelain bowls and advancements in flushing technology takes place every November 19th, although some cats don’t need a hashtag holiday as an excuse to tamper with their humans’ toilets. Here are five cases of cats caught in the act while messing with toilets. A classic of the form, here we present Boots the cat, who’s a fine tuxedo rescue, doing his best to literally unravel his human’s beloved toilet paper roll. To what ultimate end? That’s between Boots and his therapist. Ever had a sewer rat climb up through the pipes and into your toilet bowl? Thankfully, the answer is probably not. But if this nightmarish scenario does occur, be grateful there are cats like Rascal around to deal with the problem. Bengals are curious and athletic felines, and in the case of this kittenish scamp, there is apparently much intrigue in finding out what exactly lies inside the toilet bowl. But alas, Mia the Bengal just cannot get a good grip on that sleek porcelain. At one point, it seems like this intrepid feline has literally lapped up all of the water in the toilet bowl. But a refreshing flush keeps him on his paws and refills his water hole of choice. Let’s meet Yves. 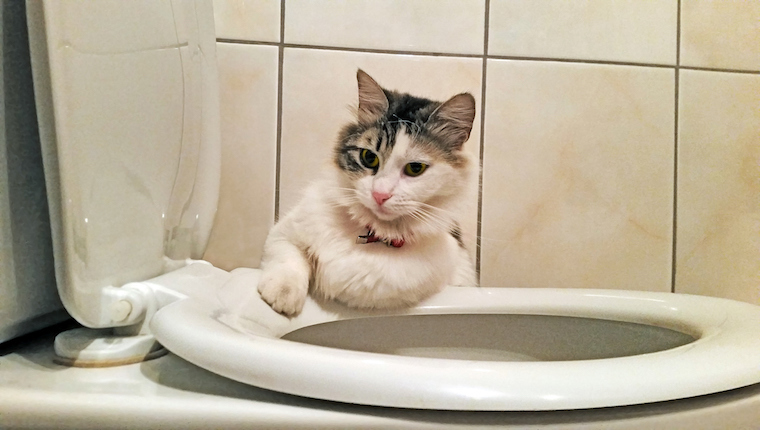 He’s a two-year-old cat living in Austria, and he just so happens to have a thing for sitting inside the toilet bowl. Nope, Yves is not pooping–he’s literally just hanging out in the bowl. Finally, for those days when your butler is nowhere to be found, make sure to train your own cat to flush the toilet for you–just like helpful Oscar here. Have you ever seen your cat doing anything funny with your toilet? Tell us about it in the comments below!